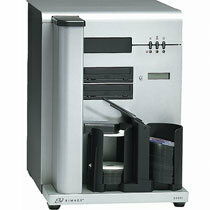 The Rimage 2000i™ Series II is a simple, out-of-box solution for recording and printing CDs, DVDs and Blu-Ray Discs. In a matter of minutes, the Rimage 2000i can be installed and producing discs. Affordable inkjet printing offers a wide range of colors, resulting in vivid graphics with sharp, easy-to-read text. •Rimage Software Suite (RSS) – Network allows the 2000i Series II to be connected to a network for use by anyone. It is a complete set of tools that include CD Designer, QuickDisc, WebRSM, WebQD and Rimage System Manager. DiscFlow for Mac is optional. Ink-jet printer, Rimage Software Suite. Imageable Formats The Imaging Server Software can create ISO 9660 images (Level 1; Level 1, Relaxed; Level 2, Joliet). Macintosh HFS, Hybrid ISO 9660/HFS and ISO 9660 with Apple® Extensions images. Software Rimage Software Suite (RSS) – Iincludes CD Designer, QuickDisc, WebRSM, WebQD and Rimage System Manager. DiscFlow for Mac is optional. CD-ROM (Yellow Book Mode 1). 2,Mode 2 with interleaved Form 1 and Form 2). Mixed Mode (CD-ROM and CD-DA). Bin Capacities 100 disc input bin. 110 disc output bin. Physical Dimensions: 15.8″ W x 21″ H x 20″ D Weight: 62 lbs. Operating Temperature 60ºF-77ºF (15.5ºC-25ºC). Limited by recorder. Service Options Various Rimage Service Programs are available.Contact your local Rimage Service Representative for details. Rimage Video Protect is ideal for anyone creating video DVDs, to protect against unauthorized duplication. RVP’s proprietary DVD copy control technology helps film studios and production companies protect their assets. Copy controlled discs have full DVD playability matching that of unprotected DVDs. Menus, special features and extras remain unaffected. Stacks, duplicates & prints 100 discs unattended. 2 18x DVD±R / 48X CD-R recorders. Includes Rimage 480i Integrated Ink-jet printer and Rimage Software Suite. Attaches to PC via 1 USB 3.0 Connection. (Does not include PC). Stacks, duplicates & prints 100 discs unattended. 2 Blu-Ray recorders.